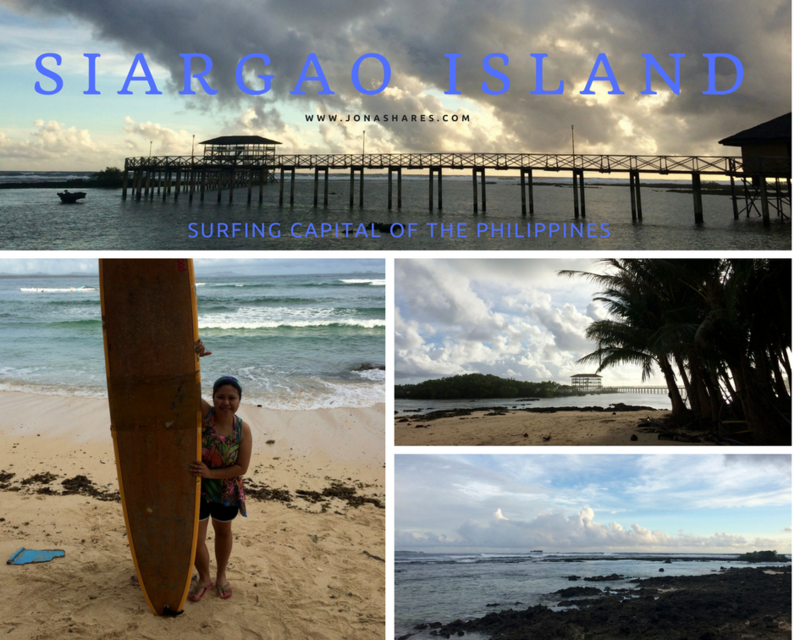 Another opportunity to visit the beautiful Camarines Norte, Philippines. Another set of municipalities that we can visit. Surely a great experience for all of us Exploring and immersing to their culture will be part of the trip. 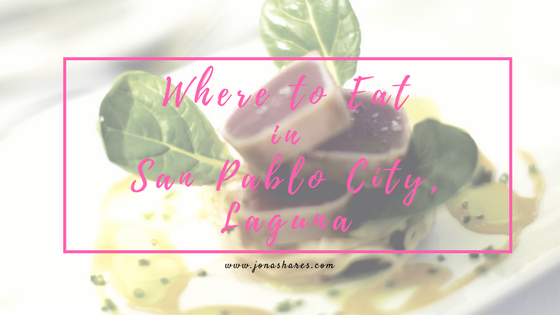 This time we were able to visit different municipalities like Mercedes and Jose Panganiban unlike before where we only explore the municipality of Capalonga. I will be sharing our experiences on each municipalities in a separate post. Municipal Hall all-glammed up for Bantayog Festival 2018. 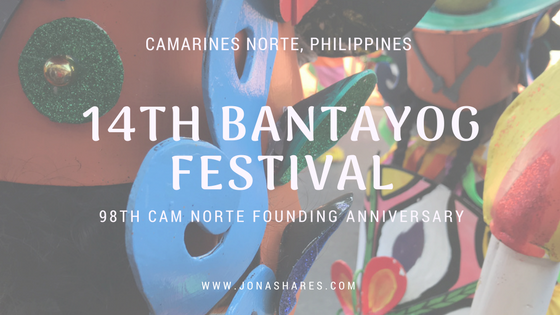 This time, let me share with you Camarines Norte's Bantayog Festival 2018. 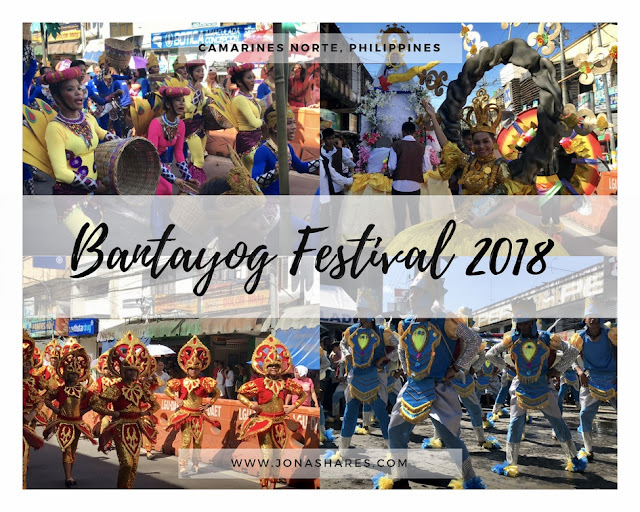 This year, they are celebrating the 14th Bantayog Festival, it is a festival that commemorates the first Rizal monument which I guess why they called it "Bantayog Festival". It is also the 98th founding anniversary of Camarines Norte. It is a month-long celebration with many activities aligned to celebrate the festival. We were able to witness the Street dance showcasing different municipalities of Camarines Norte showcasing each municipalities festivals. Also, after the street dance, the contingents proceed to the sports center to perform once again in front of the audience, judges and tourists/guests. Pinyasan (derived from the word Pineapple) Festival showcases Camarines Norte’s premiere agricultural product called Formosa which the claimed to be as the sweetest pineapple. The Palong festival coincides with the feast of the Black Nazarene. The Pabirik Festival commemorates the past culture, traditions, history and customs of Paracale considered as a gold town of Camarines Norte. It gives emphasis on its rich mining industry while showcasing its gold products all of which are available in the municipality. Pabirik means “pan” which is a medium used by the natives of Paracale in gold panning. Due to unforeseen situation, the electric power shut off but it didn't spoil the performance. The audience lighted their cellphones flashlight to help the performers and still it turned out very nice. Good thing the power interruption went back immediately. Winners received a cash prize and a trophy. Champion received two-hundred thousand pesos (Php 200,000.00), First Runner-up: one hundred fifty thousand pesos (Php 150,000.00) and one hundred thousand pesos (Php 100,000.00 for the First Runner-up. 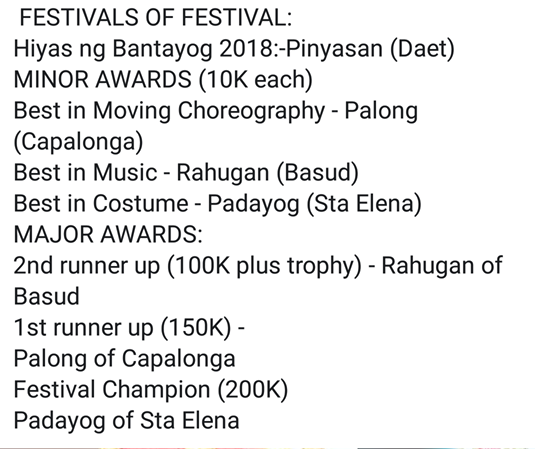 Also, there are minor awards such as Best in Moving Choreography, Best in Music, Best in Costume and Hiyas ng Bantayog 2018. 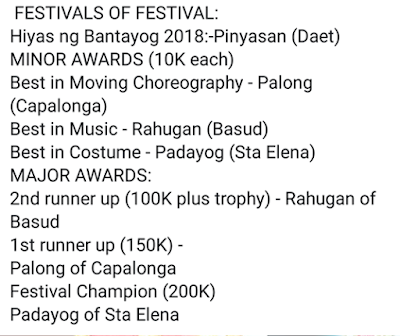 Below are the list of the winners of the recent Bantayog Festival. The costumes are so amazing. This looks like a festival that I would have fun at. I haven't been to a fun festival in way too long. I love that you shared all of the photos and videos with us because it's the next best thing to being there. What a fun and memorable event. I had never heard of the Bantayog Festival until I saw your post about it. Thanks for spreading the word! Loved the pictures--I feel like I was almost there! Wow this looks incredible, all the decorations are so beautiful and the dances are breathtaking! Love all the bright colors of the costumes. So festive and fun! That looks like a really amazing event. I would really love to see it in person! Now that is a really hopping festival! I would really enjoy something like that. This looks like an amazing festival. The costumes, decorations and dancing were beautiful. It looks like so much fun! I love how there are different sections for people to participate in, like the dancing contest one. Beautiful and bright festival. 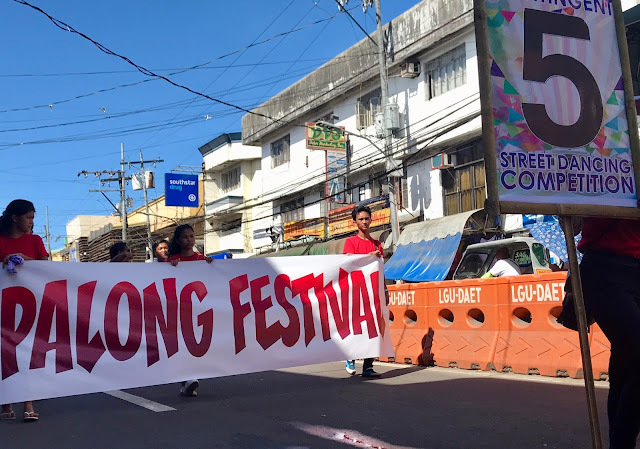 I love the colorful festival of Bantayog Festive, looks like such a fun experience and good time. Glad you shared this. I've never been in this place but it looks like a beautiful place to visit and this festival is look so amazing. They have fantastic designs of costumes and it so colorful, I better see this next time. This festival looks amazing with all the brightly colored decorations and costumes. I love the hanging hats! What a very colorful event. Hope our hometown can do something like this too! Love it! What a fun celebration! The dancing was all amazing to watch. Such talented performers, even when dealing with technical difficulties. This festival looks like it would be so much fun. I have always wanted to see street dancing like this in person. 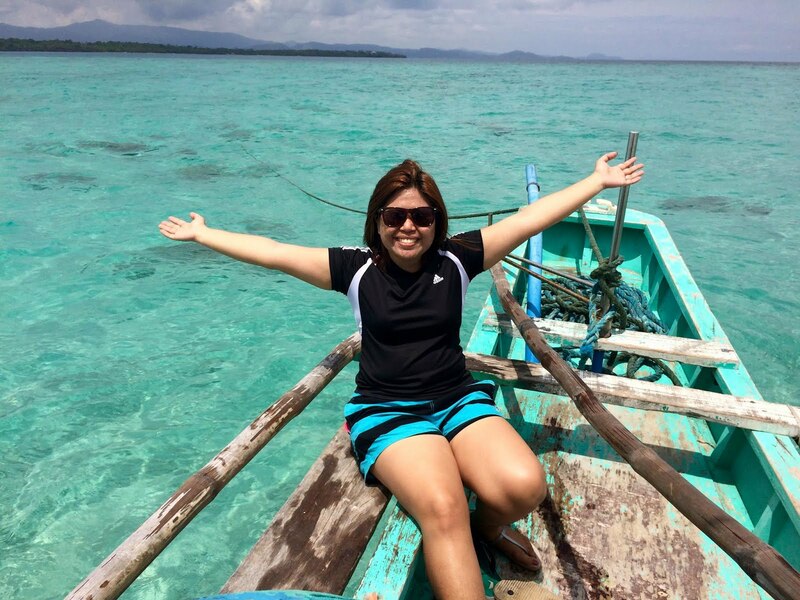 Another place I wouldn't mind going to visit Camarines Norte in the Philippines. I think I would enjoy the Bantayog Festival if we spoke the same language, maybe even if I didn't. It looks fun. Looks like a great festival to visit. I'll definitely go here one day with my family. Oh wow! How amazing! And a whole month long of festivities! I love all the dancing and I bet the food is great too! Never been in this province but it looks like a nice place to visit and to explore will definitely try to go there next year to witness this kind of event.